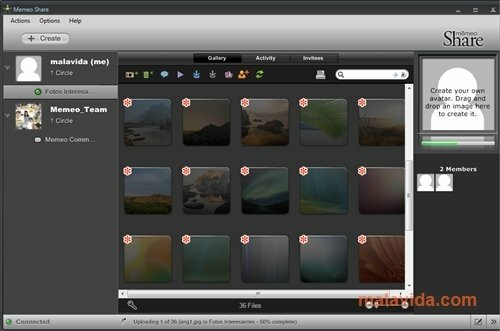 Do you like sharing photographs, videos or any other kind of file but you don't want to upload them to the Internet where everyone can see them? Memeo Share is the perfect solution, because it allows us to create our own circle of friends with whom to share whatever we want, something halfway between a private P2P network and a private social network. This simple software allows you to "Drag&Drop" any file and select who you want to share it with, depending if you just want some of your friends to have access, or all your contacts on the network. 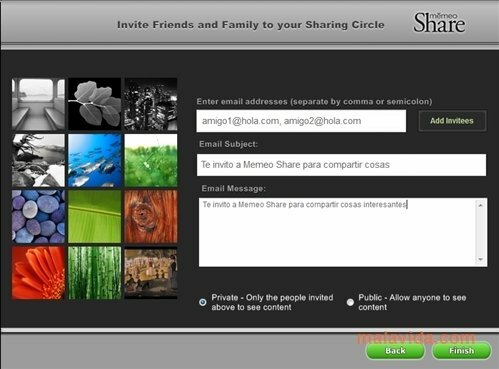 For this application to work properly, you have to invite all your friends to use Memeo Share, thus you will be able to create what they call "Sharing Circles" with whom to share anything. To do so, you select the files that you want to share and the program will take care of everything. What's more, you will also be able to access the Memeo Sharing Circle, that would be something like making the folder public. Memeo Share is a very good alternative to the email, that limits the size of attached files, with the added possibility of using it on multiple platforms, like a PC, Mac, iPhone, BlackBerry or smartphone with Android. This application requires an Internet connection to work. Requires the installation of .NET Framework 2.0, which will be installed automatically if necessary.